Features of the Clarity Hot Tub by MasterSpas - Leisure Time Warehouse | Hot Tubs, Swim Spas, and Pools. Ohio's Best Dealer! Master Spas does it again. If you want the hot tub of your dreams, you want Clarity. Don’t take my word for it, the incredible, innovative features speak for themselves. Continue reading to see exactly what the Clarity Hot Tub Series by Master Spas has to offer you. Getting to know a Master Spas hot tub or swim spa is the key to starting to live a better life. Next to filling it with water, seating is the most important part of your hot tub. And you’ll notice this as soon as you sit down in your Clarity Hot Tub by Master Spas. Specifically engineered to contour to your body, these seats allow you to relax in your most natural position. In addition to the form fitting seats, strategically placed jets provide hydrotherapy from head to toe. Now that’s total body comfort. While the seats in the Clarity Hot Tub are beyond incredible alone, the neck and shoulder seats give you comfort like you wouldn’t believe. It melts away aches and pains in an instant, you’re sure to use your hot tub daily, just for this feature. The seat is reverse molded, stress relieving, and its jets are strategically placed downwards for ultimate tension relieving on your neck and shoulders. The Clarity Hot Tub doesn’t just stop at the neck and shoulders. Biomagnetic therapy has been used for centuries to relieve pain, improve circulation, reduce swelling, and alleviate stiffness; and it’s finally making a comeback. The Biomagnetic Therapy System is standard on all Legend Series, especially because doctors are prescribing biomagnetic therapy by name. Biomagnetic Therapy helps treat back pain, arthritis, and sports injuries, to name a few. HOW IT WORKS: The Biomagnetic Therapy System uses powerful magnets behind the neck and back to provide magnetic therapy to pressure points. If you want your hot tub to be a dream come true, you’ll love the dream lighting. The dream lighting of the Clarity Series Hot Tub creates a warm and inviting glow around the exterior on the corners of your hot tub. And isn’t that everything a hot tub should be- warm and inviting? The only thing that could improve your hot tub experience is music, and the Clarity Hot Tub has your back. With the Fusion Air Sound System, you can amplify your favorite music or tv show while soaking in your spa. This upgraded feature uses Bluetooth for more convenience and faster streaming. The sound system has four, water-resistant speakers on the interior and a subwoofer to improve sound quality. The best part is you can control it all with the built-in, water resistant, touch pad, so you don’t have to worry about your devices getting wet. Finally, the sound system allows you to stream directly from your iPad or iPad mini, with an optional waterproof spot for you to store your iPad. Not only do you want to be able to enjoy the music from your Clarity Hot Tub sound system, but ultimate relaxation comes with ultimate quiet. Master Spas ensures as little noise as possible by significantly reducing pump and motor noise/ vibration. In fact, compared to industry standards, typical hot tubs have 153% more vibration. 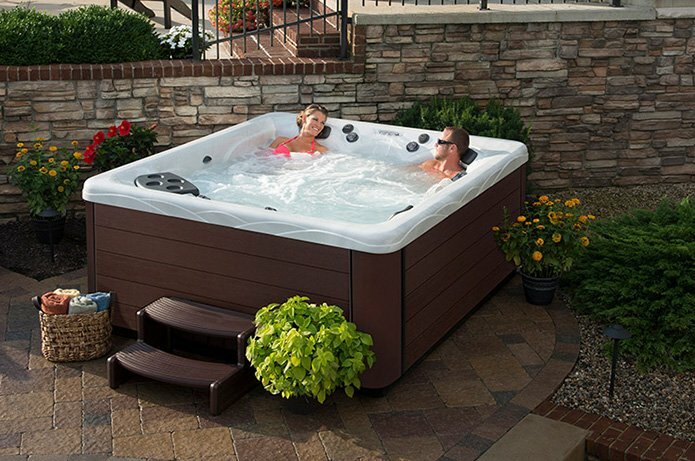 Get to know a hot tub or swim spa by Master Spas by visiting a local Master Spas dealer. If you live in the Cleveland area, you are in luck. LeisureTime Warehouse is a leading distributor of Master Spas products. Come visit our Retail Superstore and browse a wide selection of models and brands such as Clarity, Michael Phelps Legend Series and Healthy Living. You won’t be disappointed. Our sales team is happy to answer all your questions and help you pick the perfect hot tub so you can start living life better. We always offer Free estimates. Call us to learn more!